We’d love your help. Let us know what’s wrong with this preview of Suicide Hotline Hold Music by Jessy Randall. To ask other readers questions about Suicide Hotline Hold Music, please sign up. The stylistic eccentricities of Jessy Randall are certainly on full display in her new poetry and comic collection, Suicide Hotline Hold Music. Both the visual and written poems are easily accessible and quite witty. Randall's ability to shape daily life into authentic poetry is unmatched. Though they may seem so, these are not simple poems and that is part of their charm. Not only are they deeper than they seem, her line breaks create subtle and meaningful layers. 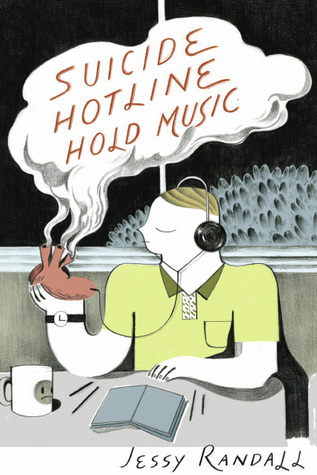 I admire Randall’s point of vie The stylistic eccentricities of Jessy Randall are certainly on full display in her new poetry and comic collection, Suicide Hotline Hold Music. Both the visual and written poems are easily accessible and quite witty. Randall's ability to shape daily life into authentic poetry is unmatched. I admire Randall’s point of view on being a mother, a wife – a human. I wholeheartedly LOVED this book! It was a refreshing and light read—even on the heavy stuff. to blow up that balloon. Jessy Randall’s poetry is witty and accessible, yet loses no thoughtful rigor or intimacy. I enjoyed this collection immensely as it sparked a certain jealousy in me as well as wonder. On my best day, I wish I was as casually funny as these poems read. Randall is turning into a profoundly good lyric poet who, because she has shed pretense as well as dilettantism, may be one of the best currently writing. A slight volume, but I enjoyed it. The comic-form poems were interesting. Some of them were clever and good -- others struck me as filler. read in a hammock in the rockies, with a view of mountains and donkeys. i loved this book. it was sweet, humorous, honest. it proved to me that poems about tiny, single, seemingly ordinary moments can be so important. i love the way the book flows, from serious and gentle, to struggles with love, to motherhood. so sweet. I suppose there is something to be said about simple witticisms, but this book was heavy on the simple and lean on wit. I did find a few of the graphic poems a bit more resonant than others, but underwhelming is the word I'd use. The title is the best part, for me. Suicide Ho Suicide Hotline Hold Music is one of those poetry books that probably would have remained off my radar if I didn't live in Denver where we have some amazing independent bookstores as well as an amazing community of talented local authors and poets. Anyone who looks further into poet and illustrator Jessy Randall's history will notice that her work has received attention in a variety of places from the conventional such as Asimov's and McSweeney's to the side of a street-cleaning truck. I am quite in love with the title and the title poem, which deals with a sad topic. For anyone who has ever been suicidal, there is humor in the situation and Randall has hit upon that. If we can't have laughter from the gallows, we have a bleak existence indeed. Half of the poems in the book are simply brilliant, economical with language, and witty. The poem, A Different Kind of Stupid deals with the question that any intelligent child thinks on hearing the story of Rapunzel: Why doesn't the pr I am quite in love with the title and the title poem, which deals with a sad topic. For anyone who has ever been suicidal, there is humor in the situation and Randall has hit upon that. If we can't have laughter from the gallows, we have a bleak existence indeed. Half of the poems in the book are simply brilliant, economical with language, and witty. The poem, A Different Kind of Stupid deals with the question that any intelligent child thinks on hearing the story of Rapunzel: Why doesn't the prince bring a rope? Turns out he might be a cad. With grace and humor, Randall expresses the world of an academic, a mother, and most importantly a thinking human being. These poems, even the ones of lesser caliber, have a heart. All the poems in the book have a heart and a warmth to them that is truly refreshing and appealing. I do wish the other poems were up to the caliber of the zinging ones, but that is an incredibly high standard. The ones that are deceptively simple and on-the-nail brilliant rest beside the ones that are 'meh' in language. It is still worth a read for all the brilliant poems and the fact that the entire book has a heart to it. The cartoons, for the most part, are distracting for me as a reader, save for two notably inventive exceptions: on page 53, the cartoon regarding a three letter word, unusual enough, to give someone great points in a beginning scrabble game, on page 65, the sheep who is narcissistic, and on page 81, the nine circles of motherhood hell. This collection of poetry makes complicated issues seem simple and manageable. The poems allow us to laugh at ourselves and at life, reminding us of times forgotten and left behind. Their innocent nature reminds us of the people we once were. i picked this up as a brief read but was slightly underwhelmed by the end of it. the diagram poems are the strongest point of the collection and there are a few genuinely funny and striking bits, but not enough.